first developed by Siemens in the mid-1990s and introduced by Mercedes-Benz under the name “Keyless Go” in 1998 on the W220 S-Classfollowing its design patent filed by Daimler-Benz on May 17, 1997. A push-button ignition switch in place of the immobiliser on a Mitsubishi Outlander Sport SE equipped with the Smart key. 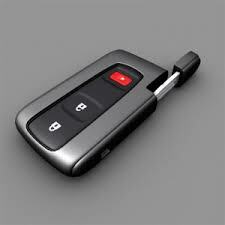 Vehicles with a smart key system can disengage the immobiliser and activate the ignition without inserting a key in the ignition, provided the driver has the key inside the car. On most vehicles, this is done by pressing a starter button or twisting an ignition switch. Some vehicles automatically adjust settings based on the smart key used to unlock the car: user preferences such as seat positions, steering wheel position, exterior mirror settings, climate control temperature settings, and stereo presets are popular adjustments, and some models such as the Ford Escape even have settings which can prevent the vehicle from exceeding a maximum speed when a certain key is used to start it.